FIX OSXRare crash if non-default skin was selected. FIX OSX64Check-marks in menus weren't working. FIX OSXWorks with OSX 10.6.x again. Added “midi preset select”-option (enabled by default) on the back. Allows you to browse presets via MIDI-CC #96 & 97 (previous & next preset) and MIDI-CC #98 & 99 (previous & next category). Allow voice limit down to 1. Layer and oscillator displays on the mix-page have been unified into one combined display that better expresses the relationships between the layers and their respective oscillators. Lots of internal changes to accomedate future expansions. If a category- or preset-name started with a dash (“-”), it couldn’t be selected anymore. RAM display would not display correctly for presets that need more than 999 MB of memory. Arp-, TG- and FX-browsers would not updated their context- menues when the name was edited. Preset-name wouldn’t update if a new preset was loaded directly by the host.
? OSX AAX 32-bit version would sometimes crash when the GUI was closed.
? After preset load, sometimes the first note played would cause an audible crackle/pop. ?Loading a preset while audio was playing would also sometimes cause an audible crackle/pop.
? Minor fixes and improvements. 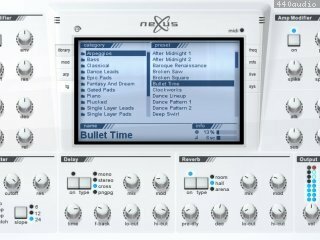 A new update has been released for Nexus2 - version 2.5.5. This update adds many new features, and is required for new expansions like "Trap" and "Hardstyle 2". Added 16 new modulation-destinations. All eight internal LFOs can now be speed- and depth-modulated via the modmatrix. Fixed a bug where the delay-FX would sometimes be out of tune for the first note. Improved auto-bypass logic for the internal FX. Improved thread-syncronization (faster and more secure). Fixes a few minor issues (e.g. stolen keyboard in Logic, mouse-wheel in Cubase etc.). Fixes all problems from the previous 2.3.0 and 2.3.1. 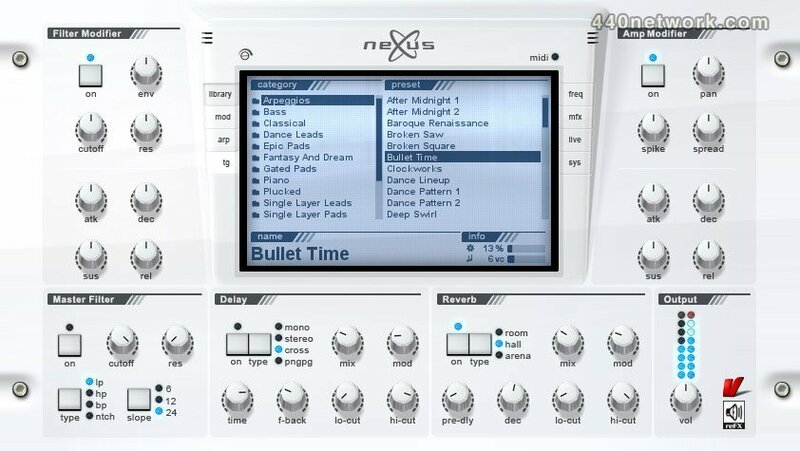 Version 2.3.0 brings in the much-anticipated 64-bit version of Nexus2. Other improvements include enhanced performance and a great new photo-realistic look for the GUI. Unfortunately only the new default white3 skin is available right now, but ALL existing skins will be replaced with new, compatible ones over the next few weeks, free of charge to all customers of the respective skins. * New insert FX: Gate. * New insert FX: Compressor. * New modulation destinations: Layer 1-4 cutoff & resonance. * Clicking in the title-bar of the librarian cycles through three font-sizes. * Under certain conditions, the ARP-shuffle would introduce clicking/noises for the shuffled notes. * If an All-Note-Off MIDI-message arrived directly before a Note-On, the ARP wouldn't start. Mainly Logic was affected. * Osc1-4 volume/panning modulations caused zipper-noise. * New insert FX: Ringmod. * All Delay-FX now follow the tempo without artifacts. * Chorus-, Flanger- & Ensemble-FX parameter changes don't introduce artifacts. * The FFT display is now more precise. * Memory optimizations. NEXUS2 now uses less memory than before. * Added new internal features for the new expansions. * OSX: Made NEXUS2 more compatible with Time Machine.